Earlier this week, Morning Consult published survey results showing voters’ top nine issues in the months leading up to the election—(in order)—Trump, the economy, health care, security, seniors’ issues, gun policy, women’s issues, education, or energy. 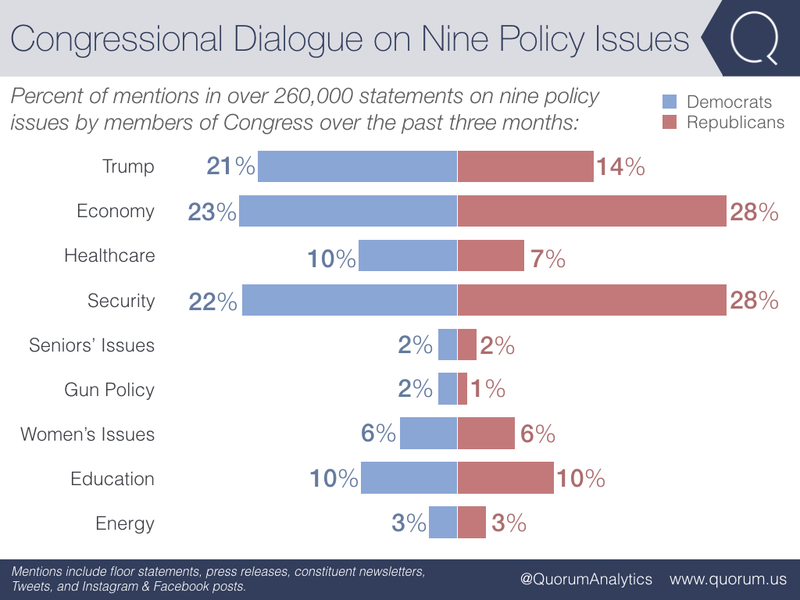 Using Quorum Federal, we explored how frequently members of Congress mentioned these nine issues over the past three months. Congress is talking about Trump more than guns, education, and energy policy. Combined, Democrats and Republicans mentioned Trump 35 percent of the time compared to a collective 29 percent share of the conversation on guns, education, and energy. Republicans outpace Democrats in mentions of the economy and security issues. Democrats hold a slight edge over Republicans in healthcare dialogue. 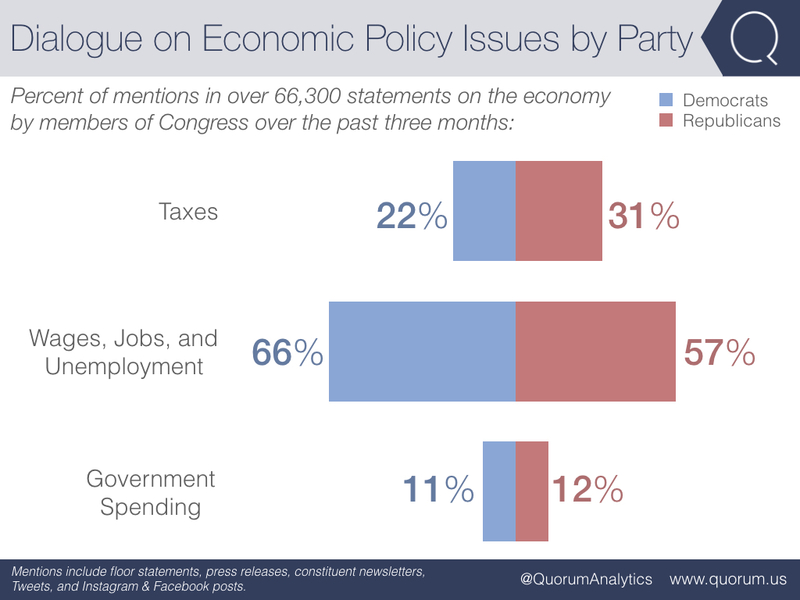 On the economy, Democrats focus on jobs while Republicans focus on taxes. In their survey, Morning Consult asked voters about specific policy issues regarding the economy, including taxes, wages, jobs & unemployment, and government spending. Thirty-one percent of Republican statements on the economy mention taxes. Across the aisle, Democrats are mentioning wages, jobs & unemployment in 66 percent of their statements on the economy. 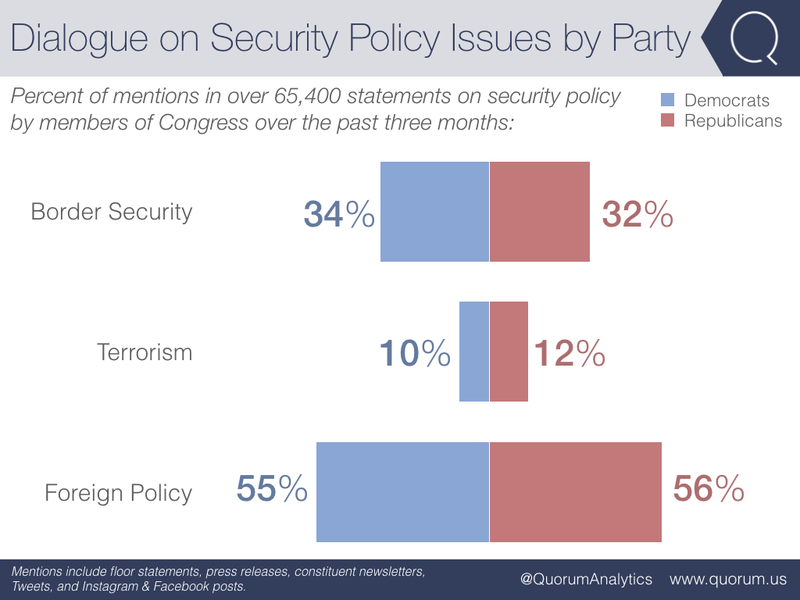 Democrats and Republicans maintain equal share of dialogue on security. On the topic of security, Morning Consult asked voters about border security, terrorism, and foreign policy. In Congress, both parties have shared a near equal percent of the dialogue on each of these policy issues.